The National Youth Jazz Orchestra is 50 years old this year. The band maintain a busy performance schedule which recently has seen them tour Germany, hold a residency a Ronnie Scott's and perform at the Royal Albert Hall as part of the BBC Proms (pictured above). 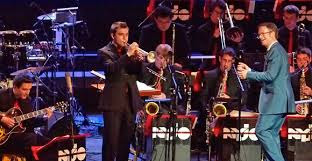 NYJO are now preparing to audition a new batch of musicians to join the band and are inviting applications from instrumentalists across the country aged 24 and under. We are looking forward to auditioning potential new NYJO chair members in January. It is always great to meet new young players who are interested in getting involved with the orchestra. Although an audition is a short amount of time to make a judgement about a player’s potential, their choice of material and ability to play it combined with sight-reading tests gives a good indication of how they might fit in the band. For some really important chairs, a trial period may be needed to ensure the right person fills the role. Although we rehearse in London every Saturday morning, through our partnership with Help Musicians we do have the funds to help pay travel expenses to any players based away from London, should they be invited to attend regular rehearsals. Even if you are not successful in becoming a chair with the band it is possible that you will be asked to be an “authorised deputy” which means doing some gigs with the band, provided you can attend some rehearsals. We’re excited about hearing you play! Auditions will take place on 9 January 2016 at the London Centre of Contemporary Music and on 10 January 2016 at Birmingham Conservatoire. For more information, visit the NYJO website.